In 1934, Danish master carpenter and builder Ole Kirk Kristiansen held a contest to find a new name for his burgeoning toy company. Since1916 Kristiansen had been operating his carpentry business in the town of Billund, Denmark,constructing mainly houses and household furniture. With the start of the Great Depression in the 1930’s, construction became a difficult way to make a living and so Kristiansen turned his attention to toys. With the shift came the need for a new name and while Kristiansen had a couple of good ideas, he also had a homemade bottle of wine, which he offered up to the employee who could come up with the best idea. The best idea was a clever contraction of two Danish words, leg godt, which translate as “play well.” The company, of course, became LEGO, a worldwide building brick phenomenon that pumps out more than 5 million little plastic blocks per hour, which is coincidentally about the same number that are currently scattered on the floors of my house. Creation Nation. There was a large outline of the US on the floor with attendees invited to build a small sculpture to help fill it in. Some were just silly and fun. Others modeled famous landmarks. Still others were inspired by McDonald’s. Because what’s more American than that? My kiddos are LEGO fanatics. And so are yours most likely because on average every person on earth owns 86 LEGO bricks. Granted, my dog probably ingested more than that number yesterday alone, but there’s still a good chance you have a few lying around. If you want to find them, just take off your shoes and walk around for a bit. Always works at my house. 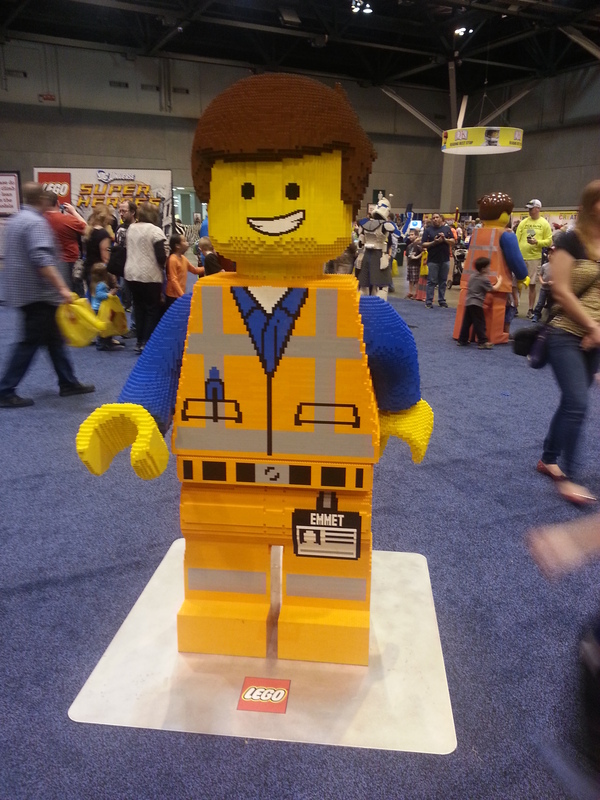 So it’s probably no surprise that when the traveling LEGO Kids Fest visited St. Louis this past weekend, my family jumped at the chance to go. I’m glad we did, because it was a seriously cool event. For two days, the Edward Jones Dome at America’s Center, normally the football stadium for the St. Louis Rams, was put to a much better use. 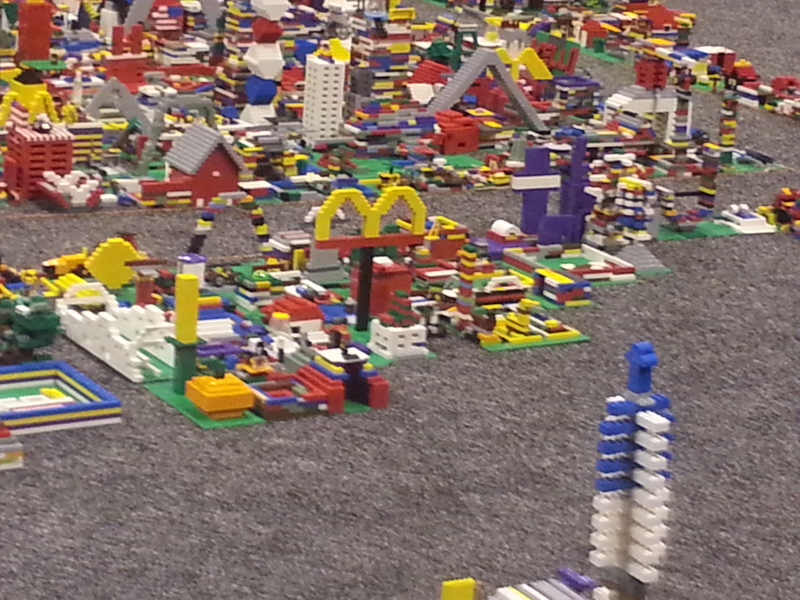 It became home to a maze of huge LEGO sculptures and interactive building activities. Kids and their families participated in build challenges and group art projects, teaming up to design and race cars or construct strength-tested bridges. Attendees could enjoy numerous free-play areas set up with tubs full of individual colors so that if they had a hankering to make a replica of the Taj Mahal using only purple bricks, they totally could. Or it was the perfect place to fulfill the lifelong dream of climbing on top of a big pile of bricks and making a LEGO angel (because who hasn’t dreamt of doing that?) before sitting down to construct a giant multicolored fish taco. 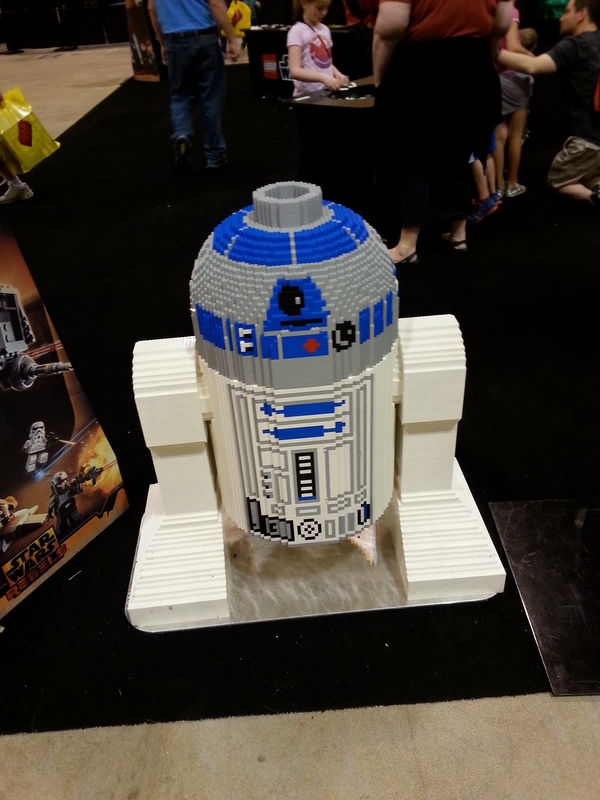 My favorite experience, though, was when we took a break and went to a presentation given by one of the LEGO Master Builders, of which there are only eight in the entire world, all based out of Enfield, Connecticut. This elite group is responsible for all of the giant LEGO sculptures you might see at the LEGO Kids Fest, or the Mall of America, or Disney World, or anywhere else you might find a giant LEGO sculpture. Yep, even Emmett has been Kra gl ed. We had the opportunity to meet Master Builder Chris Steininger during a presentation on interlocking build design in which he encouraged all the little Master Buidlers in Training to try different structures, and then strength test them with heavy metal wrecking balls. My sons learned their lessons well, intentionally designing weak structures to achieve more spectacular destruction. Not surprisingly he answered, “Yes,” explaining that even though sometimes there are frustrating design issues to work out and building a new model, layer by layer, gluing each in place along the way (yes, for all you LEGO Movie fans out there, I’m sorry to tell you master builders do use “Kra gl e”) can be tedious, basically what he does for a living is play well. And what could be better than that? Which is what Ole Kristiansen decided, too. It would be a few years before the emergence of the patented stud-and-tube interlocking brick system that is still inspiring little builders today, but in 1934, Ole knew what he wanted his company to be about. And deep down, he also knew what he wanted to call it. He decided to stick with his own idea and called the company LEGO. There’s no record of whether or not he shared the bottle of wine. My mom still has the Lego’s we loved as kids and pulls them out for my nieces and nephew when they visit. I spent so many hours building houses, and based my love of babysitters on whether they were interested, and talented at, spending the evening building Lego houses. Sounds like a fun event!